Does Academy Dental accept insurance? Are your dentists network providers? If my tooth doesn't hurt and my filling is still in place, why would the filling need to be replaced? What about an article I found on the web? Can my teeth be any brighter? What over-the-counter whitening products are available? How necessary is it to replace my missing tooth? What options do I have for replacing a tooth? Yes--with one exception. We are currently unable to accept new adult MaineCare patients. Except for adult MaineCare, Academy Dental processes all insurance claims for all all insurance companies. Hopefully this service will your paperwork easier. 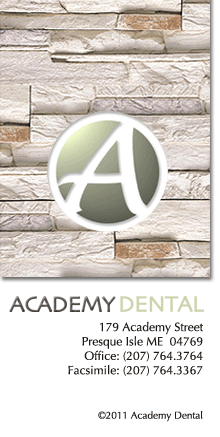 Academy Dental is a network provider for Delta Dental. We participate in both the Delta Dental Premier and PPO networks. Please ask at the front desk if there is any way we can assist you with your dental insurance questions. And, as always, take the time to read and understand the benefits afforded to you by your dental insurance plan. Tooth decay is a destruction of the tooth enamel. It occurs when foods containing carbohydrates (sugars and starches) such as milk, soda, cakes or candy are frequently left on the teeth. Bacteria that live in the mouth thrive on these foods, producing acids as a result. Over a period of time, these acids destroy tooth enamel, resulting in tooth decay. Ask us about the use of supplemental fluoride, which strengthens your teeth, and about the use of dental sealants (a plastic protective coating) applied to the chewing surfaces of the back teeth to protect them from decay. Visit us regularly for professional cleanings and an oral examination. No. Changes that occur with aging make cavities an adult problem, too. Recession of the gums away from the teeth, combined with an increased incidence of periodontal (gum) disease, can expose tooth roots to plaque. Tooth roots are covered with cementum, a softer tissue than enamel. They are susceptible to decay and are more sensitive to touch and to hot and cold. The majority of people over age 50 have tooth-root decay. Decay around the edges, or margins, of fillings is also common to older adults. Because many older adults lacked benefits of fluoride and modern preventive dental care when they were growing up, they often have a number of dental fillings. Over the years, these fillings may weaken and tend to fracture and leak around the edges. Bacteria accumulate in these tiny crevices causing acid to build up which leads to decay. Constant pressure from chewing, grinding, or clenching can cause dental fillings or restorations to wear away, chip, or crack. Although you may not be able to tell that your filling is wearing down, we identify weaknesses in your restorations during your regular check-ups. The Internet's vast resources offer many options for finding dental health information, but how can you determine if a Web site is trustworthy and accurate? Just because something is posted on the Internet does not mean the information is true or reliable. Why is the person or organization writing about a particular topic? Is the information provided in the public interest? Is any advertising clearly separate from the health information? Does the site promote a particular cause or point of view? Is the person or organization trying to raise money? Does the website solicit personal information? Are they asking you to do something on their behalf? Is there a link describing the sponsor? Is there a way to verify the websites sponsor with a telephone number or postal address? Is the content presented as an opinion and clearly stated as such? How long ago was the site updated? Who wrote the material? Are the author's qualifications clearly stated? What type of scientific or health care expertise does the content provider have? Does this person have a dental or medical degree? Did the information come from an objective source, such as the U.S. Food and Drug Administration, a medical or academic institution, or a well-known scientific or medical publication? Do the author's credentials reflect expertise in the area? Is the argument or conclusion supported by sound scientific evidence or just an unsubstantiated theory? Is it myth or fact? Do objective organizations such as the World Health Organization, the U.S. Food and Drug Administration, or the National Institutes of Health support these claims or conclusions? Are the study results current and does the research provide the most up-to-date facts available? Does any other credible health care organization support the findings? Only a very small number of people are allergic to one or more of the metals used in amalgam fillings. In these rare instances, the filling may trigger a localized reaction that produces symptoms similar to a skin allergy. Often patients who have this reaction to amalgam have a medical or family history of allergy to metals. Another dental filling material will be used instead of amalgam in these situations. Yes. Composite resins are tooth-colored, plastic materials (made of glass and resin) that are used both as fillings and to repair defects in the teeth. Because they are tooth-colored, it is difficult to distinguish them from natural teeth. Composites are often used on the front teeth where a natural appearance is important. They can be used on the back teeth as well depending on the location and extent of the tooth decay. At Academy Dental, composite resins cost the same as amalgam fillings. Yes. Dental implants can provide artificial teeth that look natural and feel secure. Dental implants can also be used to attach full or partial dentures. Implants, however, are not an option for everyone. Because implants require surgery, patients must be in good health, have healthy gums, have adequate bone to support the implant and be committed to meticulous oral hygiene and regular dental visits. If you are considering implants, a thorough evaluation at our office will help determine if you would be a good candidate. Implant surgery is usually done at one of the local oral surgeon's office. A local or general anesthetic may be used. Usually pain medications and, when necessary, antibiotics are prescribed. We will give you instructions on diet and oral hygiene. You may want to start by paying us a visit. We can tell you whether whitening procedures may be effective for you. Whiteners may not correct all types of discoloration. For example, yellow-ish hued teeth will probably bleach well, brownish-colored teeth may bleach less well, and grayish-hued teeth may not bleach well at all. Likewise, bleaching may not enhance your smile if you have had bonding or tooth-colored fillings placed in your front teeth. The whitener will not affect the color of these materials, and they will stand out in your newly whitened smile. In these cases, you may want to investigate other options, like porcelain veneers or dental bonding. If you are a candidate for bleaching, some dentists may suggest a procedure that can be done in the office. This procedure is called chairside bleaching and may require more than one office visit. Each visit may take from 30 minutes to one hour. During chairside bleaching, the dentist will apply either a protective gel to your gums or a rubber shield to protect the oral soft tissues. A bleaching agent is then applied to the teeth, and a special light may be used to enhance the action of the agent. Lasers have been used during tooth whitening procedures to enhance the action of the whitening agent. We at Academy Dental do not currently offer in-office bleaching. Tray-based whitening products are used at home and are dispensed by us. These products require the fabrication of bleaching trays unique to your own teeth and a bleaching solution. Bleaching solutions. These products contain peroxide(s), which actually bleach the tooth enamel. These products rely on percent carbamide peroxide as the bleaching agent. Carbamide peroxide comes in several different concentrations (e.g., 10%, 16%, 22%). Peroxide-containing whiteners typically come in a gel and are placed in your custom bleaching trays. Usage regimens vary. Some products are used for about twice a day for 2 weeks, and others are intended for overnight use for 1-2 weeks. When you obtain the bleaching solution from us, we'll make a custom-fitted bleaching tray for you that will fit your teeth precisely. We'll also visit with you regarding possible side effects. Teeth that are undergoing whitening can become quite bothersome. For example, teeth can become sensitive during the period when you are using the bleaching solution. In many cases, this sensitivity is temporary and should lessen once the treatment is finished. Some people also experience soft tissue irritation from either the tray or from the bleaching solution that may come in contact with the tissues. There are many types of products available for use at home that are purchased over-the-counter. Toothpastes. All toothpastes help remove surface stain through the action of mild abrasives. "Whitening" toothpastes have special chemical or polishing agents that provide additional stain removal effectiveness. Unlike bleaches, these products do not alter the intrinsic color of teeth. Whiteners. These include over-the-counter strips and rinses and even gels. If you have interest, we usually recommend a trial period with any of these FDA approved products. It has been our experience that results vary too widely to make product recommendations. When selecting a whitener or any dental product, we recommend you look for the ADA Seal of Acceptanceyour assurance that ADA standards of safety and effectiveness have been met. In Aroostook County, this is often an issue of logistics. The nearest periodontists are a long distance away. In early stage periodontal disease, Academy Dental does a great job in meeting the treatment needs of its patients. In cases of more involved and complex periodontal disease, Academy Dental recommends that our patients should consider a combined treatment with both a specialist and our office. This team approach will help us (we're familiar with your dental and medical history) and your periodontist (who has extensive experience treating periodontal disease) collaborate to tailor a treatment plan that works best for your individual case. Research has shown that periodontal disease is caused by the inflammatory reaction to bacteria under the gums, so periodontal disease technically may not be contagious. However, the bacteria that cause the inflammatory reaction can be spread through saliva. This means that if one of your family members has periodontal disease, it’s a good idea to avoid contact with their saliva by not sharing eating utensils or oral health equipment. If you notice that your spouse or a family member has the warning signs of a possible periodontal problem (bleeding, red and swollen gums, or bad breath) you may want to suggest that they come see us for an exam. It may help to protect the oral health of everyone in the family. The connection between gum disease and heart disease is a very hot topic in the field of periodontics right now! Several research studies have indicated that heart disease and gum disease may be linked, and researchers suspect that inflammation may be the basis behind this relationship. If you are at risk for heart disease, it is a good idea to mention this to us since gum disease may increase this risk. Go here to find more information from perio.org. The best way to prevent periodontal disease is to take good care of your teeth and gums at home. This includes brushing your teeth after every meal and before bedtime, flossing at least once each day, and seeing your dentist or periodontist for regular exams twice a year. Spending a few minutes a day on preventive measures may save you the time and money of treating periodontal disease! Some of our patients choose to postpone or forego tooth replacement altogether. This obviously depends on the particular tooth and its role in the appearance and function of each unique mouth and bite. Some patients do quite well with several missing teeth and a shortened dental arch. Others insist on quickly restoring any failure of their natural teeth. At Academy Dental, we are committed to providing you the individual information and care that will allow you to assume an informed and comfortable role in choosing what treatment options work best for you. Depending on the tooth and your own situation, we at Academy Dental may recommend one or more of three options: i) a dental implant; ii) a fixed bridge; or iii) a removable partial denture (or removable bridge). A dental implant is a secure and stable tooth replacement option that most resembles the function of a natural tooth. Instead of tooth roots, an implant has a surgically placed titanium anchor. Dentists often refer to the anchor as the "implant" itself. Instead of an enamel crown, an implant has a porcelain crown that is attached to the anchor via a titanium post. Dentists refer to the post as the "abutment". The porcelain crown may be fabricated via a dental lab or via our CEREC CAD/CAM technology. Click here to read more about implants. A fixed bridge spans the space left by losing one or more teeth. In order to span this space, a fixed bridge depends on the teeth of an arch before and after the toothless space. Fixed bridges are not possible if the toothless space is at the end of the dental arch. A fixed bridge consists of a series of three or more special porcelain crowns attached in a row. At both ends of a fixed bridge are special porcelain crowns called "abutments". Between the abutments are the porcelain crowns meant to replace the missing teeth. These porcelain crowns are called "pontics". Fixed bridges are made in dental labs. Fixed bridges are attached permanently by special cements to the teeth neighboring the toothless space in a dental arch. Click here to read more about fixed bridges. A removable partial denture or RPD (sometimes called a removable bridge) is a custom appliance built for a specific mouth and a specific set of teeth. Built on a precision fabricated metal framework, an RPD consists of features that allow it to firmly attach to the remaining teeth. Where teeth are missing, artificial teeth are placed on the framework. As its name implies, an RPD is easily removed from the mouth. It should be removed and cleaned routinely. There are many types and features available for RPDs. At Academy Dental, we'll help you choose which RPD will work best for you.